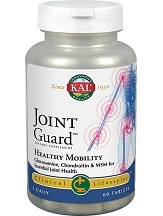 KAL Joint Guard with Glucosamine, Cofactors, Collagen and Mucopolysaccharides is designed to support the bones and tendons in your joints. It strengthens, repairs and speeds healing of joint injuries as well as a great remedy for arthritis pain. It provides the joints with the building blocks they need to repair damage caused by osteoarthritis or injuries. For more information on this product, read the complete review. The manufacturer of this product recommends to take two tablets daily, preferably with a meal. It is very important to take this tablet only based on usage directions. The cost of one bottle containing 60 tablets costs $12.69 which is cheaper than the retail price of $20.59. This option enables potential buyers to save 38%. Vitacost offers promo codes and special offers in addition to new deals daily which includes for this product as well, at the time of writing this review. It is possible to save 10% by taking advantage of the exclusive offers, free shipping events, health tips and more available in Vitacost. The value price of one bottle containing 120 capsules in Vitamin Shoppe is $28.49 which is cheaper than the list price of $35.19 and helps buyers save $6.70. This product must be stored in a cool, dry place and it must not be used if the safety seal is broken or missing. Pregnant or lactating women should consult their physician prior to taking this product. It must be used with caution if allergic to shellfish. Vitcost enables potential buyers to shop with confidence at Vitacost.com. If you are unhappy with this product for any reason, they will provide a full refund or replacement if requested within 60 days of purchase. If you want to return an unopened product, there are never any restocking fees and Vitacost will gladly refund your return shipping costs, especially for domestic returns. Vitacost has made it very easy to process refund or replacement online with just a few clicks. However, replacements are not available for international orders. This product with glucosamine cofactor formula is intended to provide nutritive support for healthy mobility. It not only strengthens, repairs and speeds healing of joint injuries but also acts a long term remedy for joint health. However, the refund and return policy seems to be limited only for unopened items and replacements are restricted only to domestic returns which may be a disadvantage for international customers. It is also known to cause adverse effects for those who are allergic to shellfish. There are n’t many reviews for this product, at the time of writing this review.